Yesterday I went hunting in a store selling used records. As it's located close to where I live (in fact I pass it daily on my way to work) I'm a regular visitor. As usual, I looked through the Elvis CD's, and noticed a couple of bootleg releases. 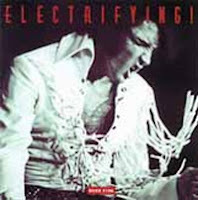 One of them caught my attention, a Bilko album titled Electrifying! As the price was a bargain, I laid my hands on it immediately. The CD contains 16 rehearsals from July 1970 as well as eight tracks from Elvis' February closing show in Las Vegas the same year. When I played it I was pleasantly surprised to discover a couple of numbers from the rehearsals in Culver City that I've never heard before. The highlight was a long running version of "My Baby Left Me" (4:46 minutes) from July 29, as well as a blues version of "That's All Right" from July 15. I find it interesting that this version isn't listed in either Tunzi's och Jorgensen's recording sessions books. I also have to mention "Patch It Up," where Elvis after the song exclaims, "OK, that's good. A good feel." And then there's "Stranger In The Crowd," the same version as featured in That's The Way It Is, with some funky drumming by Mr Tutt. A personal favorite of mine! Listening to these rehearsals tracks made me feel good, as Elvis seems to be enjoying himself and includes some funny lyric changes from time to time. "Let it out and shove it in" as featured on "Hey Jude" is one such example, "I'll be oh so horny" instead of "I'll be oh so lonely" on "Love Me" another. What's more, a lot of the rehearsals haven't even been released officially, like "My Baby Left Me" and "That's All Right" mentioned above. I for one would love to see a box set dedicated to the TTWII rehearsals, with a great booklet and interesting pictures. How about it, Ernst? I'd love to buy an official release like you described. Sometimes I don't think Sony/BMG/FTD, whoever, really know what they are sitting on when it comes to stuff like that. On YouTube, I heard a version of "Memories" from the 1970 rehearsals that has changed my impression of the song forever, a hilarious version of a song that is so often played as the sad conclusion to so many Elvis documentaries. If I were making an Elvis documentary, I'd end with the humorous version of "Memories" from 1970 instead. I think he'd want fans to remember him in a fun way like that, rather than the more maudlin tributes that continue to this day. Great idea, Tygrrius. And as you say, Elvis would have loved it! I agree with both of you! It really is a lost opportunity and yes, the funny version of "Memories" would be a great way to end an Elvis documentary. Thank you for your thoughts!